I finally have done it, my first stall and my nervous were running a hundred miles an hour I was nearly dizzy. But after I set everything up, introduced myself to some of the lovely ladies around me and made my first stall in the first 20 mins, I managed to calm my nerves. 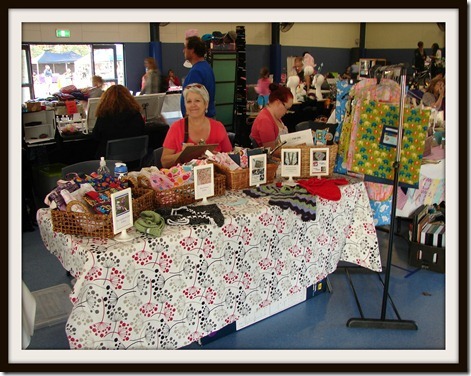 Here is a picture of my stall. What do you think? My mum came down to keep me company after she finished work. Here she is pretending to be doing something lol. I have learnt a lot from doing this stall and know what I would do differently next time. I think I definitely need another table as I didn’t take as much as I had planned too. The new items that I made for the stall and did not sell will be up on the Made It site this week. Just need to take a few pictures. I also have my new Tooth Fairy Mobile that I can’t wait to share with you and I will be making more regular postings on the blog along with more tutorials. So I hope you all enjoy the rest of your weekend and I will be back on board this week.